Heat oil in a large skillet over medium-high heat. Add onion, and sauté until browned. 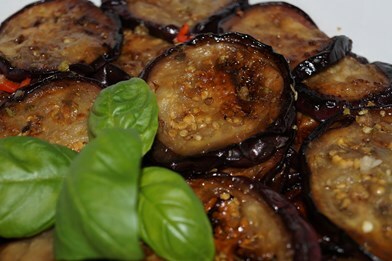 Remove the onion to a bowl, and place eggplant slices in the hot skillet. Fry on both sides until browned and tender. Season with salt and pepper. When the eggplant is tender, top slices with onion, and then cover with cheese. Allow cheese to melt for a few minutes before placing on plates and serving.